A collection of hardware and software from NeXT Computers, their dealers and third party developers. What's with all the NeXT names? eXTRASLIDE was GS Corporation's highly advanced software for imaging presentation graphics. 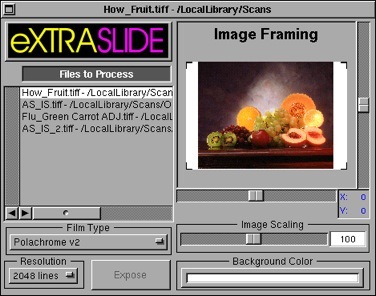 The eXTRASLIDE front-end application accepted TIFF, EPS and single-page PostScript files, and allowed users to scale and position the slides and to set custom background colors. eXTRASLIDE drove the Polaroid C1-5000S Digital Palette Film Recorder, which was capable of outputting images to 35-mm slides, 4" x 5" instant prints and other photographic media at resolutions of up to 4,096 lines. eXTRASLIDE could also be configured as a system-level printer driver, which allowed users to obtain output from any application that prints, such as Concurrence or Virtuoso. As a standalone application, eXTRASLIDE supported batch processing so that multiple slides of varying file types could be imaged without further supervision. With the addition of Partner, the Macintosh-to-NEXTSTEP networking solution from IPT, Inc. (also described in this site), Macintosh users could also access eXTRASLIDE to obtain fast, PostScript Level 2 output. eXTRASLIDE, like all of GS Corporation's eXTRAPRINT produces, incorporated GS Corporation's color management technology, which performed on-the-fly color correction at output time. The eXTRASLIDE bundle included the eXTRASLIDE driver, the Polaroid C1-5000S film recorder and a 35-mm camera back. Auco film processors, slide mounters and starter film packs are also available from GS Corporation.